Let me tell you about my television therapist. Lauren over at The Hedgepig has the same therapist I do. We both have a personal reaction to In Treatment. Mine is a bit more personal than hers, but I think I have been in television therapy longer. Spoilers for Season 3 abound in this essay, so please be forewarned. The three seasons of In Treatment provided a remarkable character arc for one particular character. 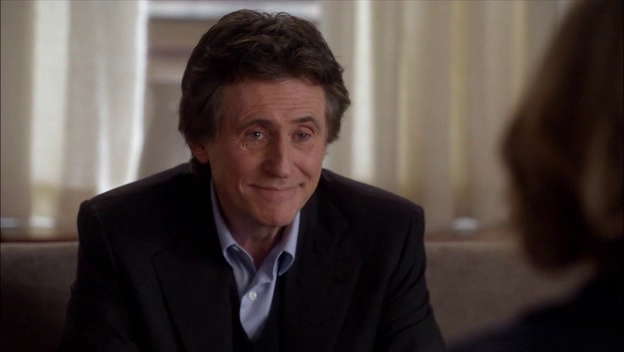 Paul Weston, played with shape-shifting mastery by Gabriel Byrne, began the first season as an accomplished therapist who was beginning to show the cracks of professional burn-out and personal despair. Byrne was mesmerizing, but so was his alter-ego, Dr. Weston. Distinguishing between the two, as episode piled on episode and those eyes sometimes pierced through the lies and dissembling of crying and arguing patients and sometimes just shone with emotion and empathy, became almost impossible. What I did not realize at the time is now so obvious that I smile ruefully when I consider it. The writers and other creatives involved in the series, and their lead actor, pulled the oldest trick in the dramatic book. They made me fall in love with Paul and then they used their Socratic muscles and made me care about the other players, and then the play itself. But not right away. Laura. Alex. Sophie. Jake and Amy. Interesting, of course, all of them. Real, multi-dimensional, complicated. Sophie in particular grabbed my heart and would not let go. But no one held my rapt and absolute attention the way Paul did. How could this be? 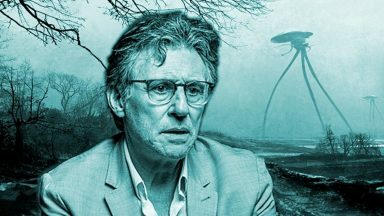 I knew this guy, the actor Gabriel Byrne. I had seen most of his films over the years and always appreciated his work. None of that prepared me for the experience of falling madly and perilously in love with this image that danced on my television screen. It was such an intense experience that I wrote a letter to The Powers That Be, politely requesting a second season, please. Virginia Heffernan at The Medium, a blog she wrote for The New York Times in 2008, published my letter. I was feeling anything but polite. I was in deep withdrawal. I wanted more patients and more stories. Mostly, though, I needed more Paul. Season 2 was a very different kettle of fish. The patients began to enter into my experience of the stories more forcefully. I was so touched by April, so pissed off at Mia, so intrigued by Walter and Oliver–Paul was as entrancing and disturbing as ever, but the characters with whom he was interacting began to play an equal role. How could so much pain and anguish be borne? How could people struggle so hard to not change? How could they not recognize what was happening to them? And how could Paul just sit there, appointment after appointment, dealing with this onslaught of self-delusion and deception? How? Because he was as self-deluded and deceptive as they were. This was unthinkable. But it was turning out to be true and it was fascinating and ultimately far more instructive. The writers and the actors created a world I understood now. The human condition was playing out on the screen every evening. And now I saw that the healer needed to be healed. How intriguing was that? Nothing prepared me for Season 3. Here is the personal part. My husband passed away on October 16 after a long illness. A few days later, the new season, for which I had been preparing at this website for weeks, began. I did watch (it was better than crying my eyes out all the time), but often I turned away. There was too much that was too true for me. Sunil had lost his wife of thirty years and was inconsolable. Yes. Frances was faced with death in her family and the possibility of her own illness. Yes. Jesse struggled with his adoption (I am adopted myself), which turned out to be much more important than his sexual orientation. Yes. And Paul was sure he was developing Parkinson’s disease (a disease that destroyed my biological father) plus he was having his old doubts about his work. Yes. Good God. This was not entertainment. Or drama. This was real life (my life!) spilling out of the television into my living room (a room that used to be “our” living room). I found that my regard for Paul as a therapist, while not diminished, moved to the background, and the stories of his patients and his own personal struggles transfixed me. How could fiction be so real? How could something on the screen reflect the reality of my existence so accurately, so intensely? The fourth wall was completely blasted away during these episodes. I was there. They were here. This does not happen. Was I crazy? You accept a growing paralysis rather than taking a risk of finding where or towards whom your real passion lies. Is it any wonder you haven’t found what drives you yet? You’re fifty seven years old. At a certain point you have to move past the stories that you’ve assigned to your life. The steadfast explanations that you’ve settled on years ago. You have to look at yourself again. For real answers. You have to take that risk. Watching Paul take in her words was a revelation (Gabriel Byrne should win every award on the planet for this role). And typically, he prevaricated by playing the Transference card. Hearts fluttered. But Adele could have been speaking to me. She was speaking to me. And yes, I am fifty seven years old (that is the last of the fiction/real life parallels, thank goodness). I tried to talk to her on the screen. How, Adele? How in the world do I do that? Later, I found myself remembering her words (the words of Dan Futterman and Anya Epstein, of course, but Amy Ryan makes them so real and so natural that they seem to flow wisely from herself) over the next weeks and attempting to follow through on her advice. Move past the stories you have assigned to your life. Look at yourself again. You have to take that risk. I was in television therapy. Paul was in treatment. I was In Treatment. As the ending of each character’s story played out, I breathed a sigh of relief. These endings were disturbing (Jesse), unexpected (Sunil), and real (Frances). Watching their experience with Paul come to a close made me feel better about my own life and good about him as a therapist. My own life had no closure, so it was comforting to view closure on the screen. And comforting to see Paul follow through for his patients. He failed and he succeeded. He was no longer the icon I had experienced in the first season or the troubled but appealing enigma of the second. He was a man dealing with his own pain. But he was there for his patients anyway. He always tried and he never gave up, no matter how often he said he would. He never gave up. Until he did. “My door will always be open to you.” “Well, that’s okay. You can close it behind me.” Seeing Paul walk out of Adele’s office and into the streets of Brooklyn, a changed man, brought the entire story to an close for me. Somehow, over the course of the weeks he had spent haranguing, hiding, and transferring in her office, she had led him to this realization: that he could no longer be a therapist. His reasons are his own–it’s too confusing, it’s too hard, I need to free myself, I have to stop, I can’t sit in a room listening to people anymore–and he still finds it difficult to be honest with himself sometimes, but we know that he cannot continue to try to help and heal others at the expense of his own psyche. And since he cannot figure out a way to do both–help others and become whole himself–it was time to stop. So, then, it is time for In Treatment to stop, too. Television therapy has much to recommend it, but when the therapist moves on, we must move on, too, painful as it might be. There is a way to make Season 4 a reality, of course. Adele takes Paul’s place and the line of patients knocking at her door continues. Paul might even be one of those patients. Probably not, though. He’s off writing his book. “The Artifice of Therapy: One Man’s Journey.” And what a journey it was. Wow, Stella. That was so beautiful and moving. I saw some similar parallels between what Pauls does and what I do. The holding back that is. It’s a bit freaky seeing it reflected back at you. I’m glad that it ultimately seemed to be of help and comfort to you. Hugs! Stella, Stella, Stella what a well written, honest and personal view you have written. I am sure that In Treatment has done a lot of good for a lot of people. I dont have a favorite season, but as you said of course some characters feels closer to your heart then others, maybe those you can relate to in a personal way?! Stella, you’re a sweet and dear friend. I’d like to share with you some thoughts and feelings, ok? Like you, I feel that Paul is also often right next to me and some characters have anxieties that I carry. There are some situations, which recognize and feel like part of me was in those characters. I did Analysis some years in my life to know that even therapists, have their problems – like Paul had them. Anyway, his words were sweet, sincere and touching to me deeply. Honestly, in my point of view, it was very nice and brave of you share your feelings with all of us, your virtual friends. It’s a honour for me to be here and be part of this site. Thanks for sharing what In Treatment has meant for you Stella. I love Gabriel as Paul Weston so I hope for more In Treatment with much Gabriel in it in the future. There is so much to learn from a tv series like In Treatment. We learn to see our own life in a new perspective. Stella, you do us all a great honor by sharing your recent experiences in such an unguarded, compelling, and moving way. I was saddened to hear about all that you’ve been through, but encouraged to feel, though your words and your sentiments, the courage and optimism you so clearly possess. Then, to have all these remarkable overlaps with the characters in the TV show is absolutely uncanny as well. I admire you for sharing what you have with such openness and in such depth. Thank you for that, and for all you’ve done on this great website also. Thank you for keeping us up to date. Thank you for being generous. I’ve had moments too when suddenly the synchronicity of the Universe is unbelievable, but true. Thanks for sharing when it happened to you, Stella! And through all of this you kept this site together. I hope it helped you get through this year – I know all of us here have been very thankful for your efforts. I’m fifty seven too, it’s a nice age, once you accept the extra wrinkles. I too think that this may be the last year of In Treatment, though I hope it is not. Stay well, and know we all support you! Thanks to everyone for your very kind comments and your support. I should have noted that writing for Byrneholics is also a very important “therapy” for me–I guess that is kinda obvious! 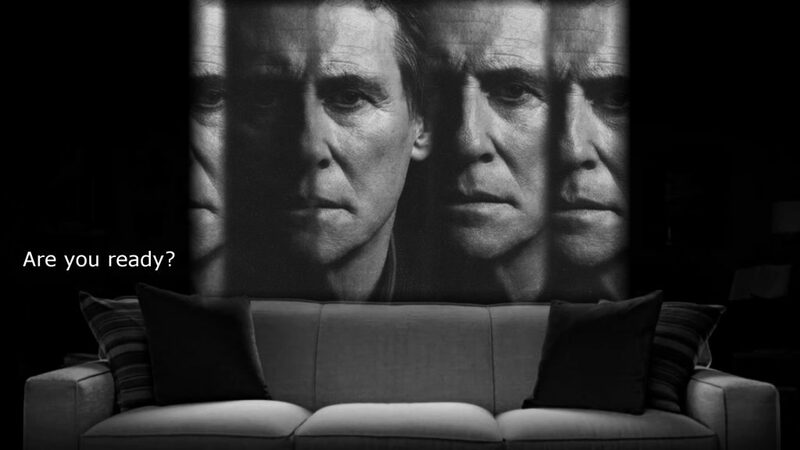 ;-) I am very glad that Gabriel Byrne has brought us all together. “Honestly, in my point of view, it was very nice and brave of you share your feelings with all of us, your virtual friends. these words of Andrea are really what I want to say to you. Thanks so much for the shout-out, Stella. Yes, I definitely had a different experience of In Treatment, but it really is stunning how closely the issues on the show begin to mirror one’s own life, isn’t it? I am so sorry for your loss, and yet gladdened that this brilliant work of art was able to bring at least some small modicum of closure. Thank you for sharing. Hi, Lauren! I should really give you more credit here–it was after reading your story that I realized I really wanted to write mine and it was comforting to know that someone else out there was experiencing In Treatment in a personal way. So thanks for that! Sometimes when it’s hitting close to home and more personal than you might have realized, you just can’t talk about it. But yes, there are a lot of similarities to real life here. You are a brave woman and I commend you for sharing your humanity in this post. We are not alone; we live in the same world; we share the same emotions; we have the same options….we can choose to make the lives of those around us, as well as our own, more meaningful. It is clear to all of your virtual friends, I’m sure, that you have already made your choice. Continued courage in the days ahead, my friend. Wow you have a way with words stella, made for enjoyable and moving reading. Right on sister. excuse the pun. 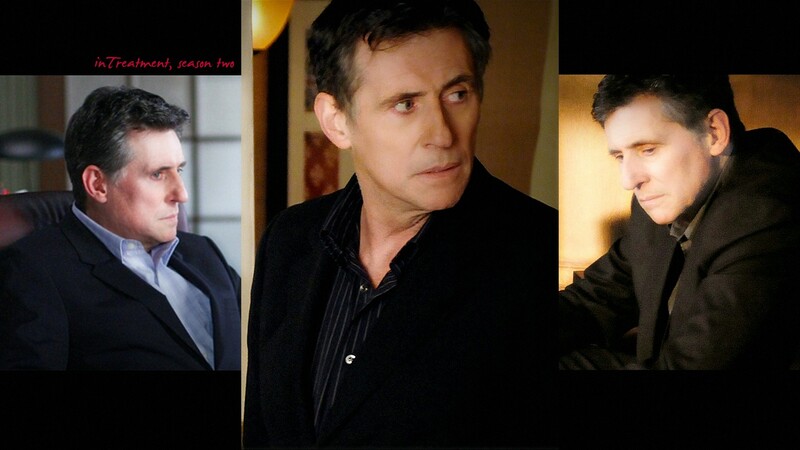 My opinion, Gabriel Byrne is one of the most talented, interesting and multiplane actors in the world. He is one of my most favourite actors since my childhood. Recently I have watched “In treatment”(1-3). In Russia this serial didn’t show on TV (oops) – I have casually found it on torrent-trekers when wanted to download for myself “Emotional arithmetics” and “Point of no return”. Muy lindas tus palabras y conmovedoras. Personalmente lo que me gustó de esta serie es encontrar en la pantalla un psicólogo con las cualidades que a uno (por lo menos a mí) nos gustaría encontrar (empático, realmente escucha, muestra interés, etc) más allá de la ficción, a pesar de que muchos dicen que este personaje no es lo que debería ser un psicólogo. Si existiera un pscicólogo/a en la vida real que inspirara lo que este personaje hace seguramente iría a terapia. Él y su consultorio (un ambiente agradable) son perfectos. Y por otro lado, me gustó encontrarme reflejada en la pantalla con algunos pacientes o con algunos determinados aspectos. Me encanta la serie y espero que haya un cuarta temporada, con Paul Weston. Very nice your words and moving. 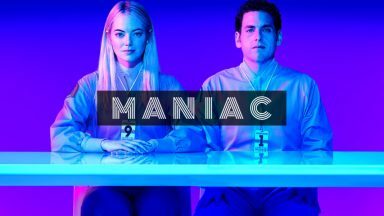 Personally, what I liked about this series is to find a psychologist on the screen with the qualities that one (at least to me) would like to find (empathetic, really listening, shows interest, etc.) beyond the fiction, despite that many say that this character is not what should be a psychologist. If there is a psychologist in real life that inspired what this character is certain to go to therapy. He and his office (a pleasant environment) are perfect. On the other hand, I enjoyed finding myself reflected in the screen with some patients or some specific aspects. I love the series and hope to have a fourth season, with Paul Weston. Might this series really return?How wonderful that would be!!! If it did, when would it be, what time and on which network? Or is it possible that we have missed it? What a shame if we have missed it–unless somehow it may be on more than once. Being extremely interested in the answers to these questions, how may I find out? Thank you for any help you may be able to furnish. 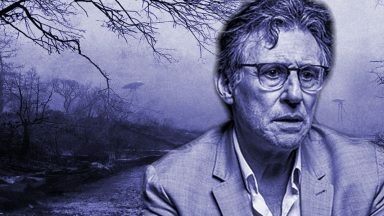 Stella: superb analysis/response to this program that has haunted me like no other. And yes, Byrne deserves every award that could be given. Me, I’d love to watch the Israeli original, to see how another culture handles these issues. Dennis, I really appreciate your kind words. I am surprised at how often this essay is read (about 5 times every day, according to my stats), but I should not be surprised because In Treatment is an experience that stays with you and won’t let go. And some people around the world are just now getting a chance to see it. Thanks for dropping by and I’m glad you enjoyed the essay! It’s curious but I’ve read just now your essay about “In Treatment”. Everything has been told by the other friends. You know how much I admire your way of writing but this, this is more than writing, this is Stella inside letting us know several aspects of her life unknown up to now, at least by me. It is not necessary to speak about Gabriel and his magnificent work in this series. You know how much I love it. And… I insist. You are very talented for writing. You should write a book. I’m sure it would be very interesting. PS. I would be happy, if you agree, to put a link on Facebook, so people can read your essay. Thanks, Verónica! I am glad you enjoyed the essay. And you are right: this is the one time I really shared some aspects of my “real life” in a blog posting on this website. I thought it was amazing, how closely the story in the last year of In Treatment aligned with my own experience. Feel free to post a link to the essay anywhere you want to. I am gratified to see how often it continues to be read, even now, over 5 years later. Just wished to commend and thank you, and the others, for the wonderful notes above. I hope life is softer, kinder, happier now for you Stella. A very close friend of mine , a therapist in nyc gives a course devoted to Season 3. 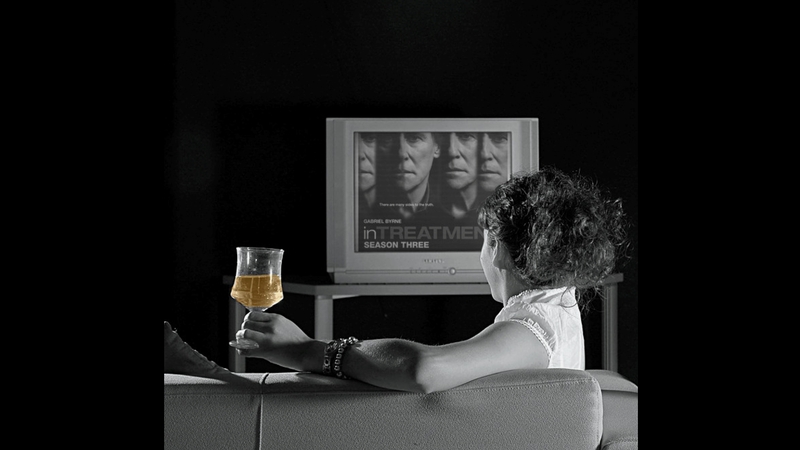 “In treatment “ is one of the finest, perhaps the finest , shows I have seen on streaming , ever. Gabriel Byrne & Mia Wasikowska. What an incredible pair to watch. Their scenes together were incredible. Thanks for your kind words, Evi. I loved Gina. I always enjoyed Dianne Wiest’s performances and her Gina is no exception. I thought the character was intriguing and a very good balance to Paul. Especially in Season 1, she really helped him, I think. Later, their relationship became too complicated, but it was understandable. Adele was a new way to understand Paul, and that worked, too. Unfortunately, there is no Season 4. So when Paul walks out of Adele’s office and into the street, he is really going out on his own and we are seeing him for the last time. Sigh. I wish this were not true, but it is. I have watched all 3 seasons several times over the years now and each time I experience something new and intriguing. It’s a great show. Gabriel is stupendous in it, as are all of his colleagues. The writing stands up over time (10 years now, since Season 1 premiered). I love it and I guess I always will.